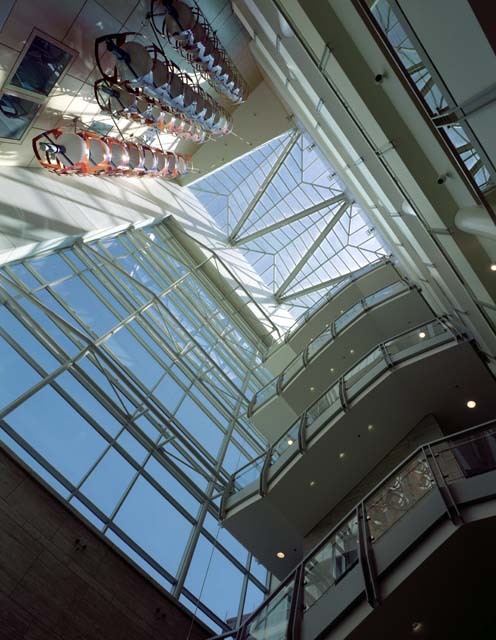 San Francisco: Flexible laboratories, informal gathering spaces, and a soaring atrium emphasize collaboration among researchers. 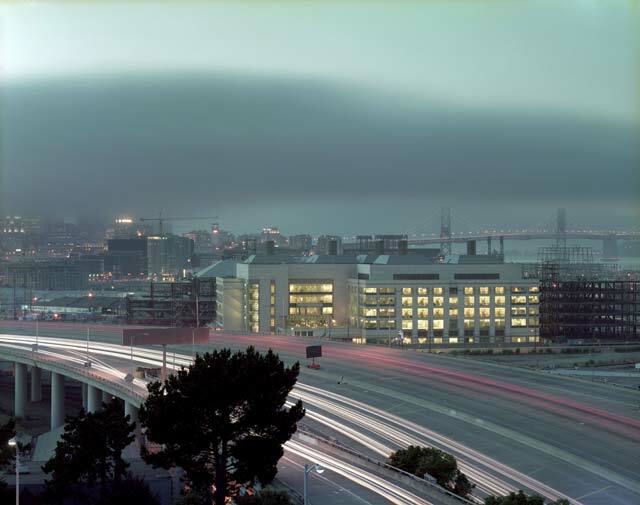 The University of California, San Francisco (UCSF), a research institution dedicated to the health sciences, long ago outgrew its cramped campus in western San Francisco. Unfortunately, neighborhood concerns and a steeply sloping site severely limited expansion. The university found the solution in a public/private partnership with Catellus Development Corporation, which was developing the new 303-acre Mission Bay neighborhood south of downtown, along the bay. 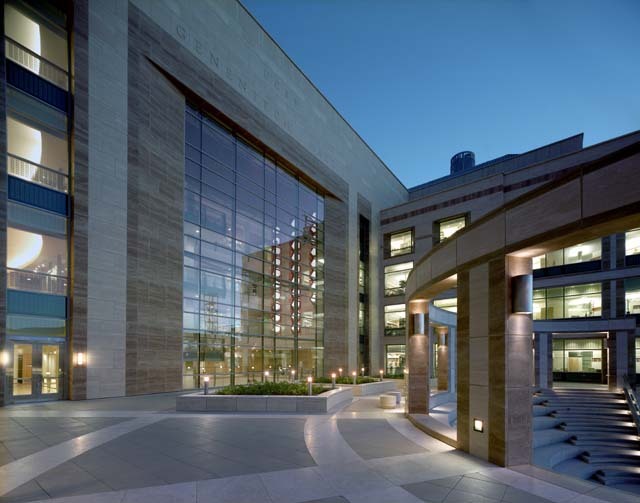 The site’s first laboratory building, UCSF Genentech Hall, designed by SmithGroup and opened at the end of 2002, houses 900 researchers and students, offering a flexible environment that promotes collaboration. The long-term goal is to attract private medical research and drug companies to form a biotech cluster around the campus. With laboratory design, flexibility is a particular challenge. 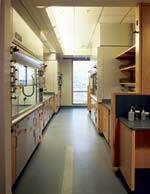 Laboratories need fixed benches for access to power, water, and compressed gas. As a result, reconfiguring is expensive. At the same time, the pace of scientific research is quickening, which means that research teams grow and shrink and the nature of their work changes more rapidly than ever. Complicating matters even further, when SmithGroup was called in to design the facility, the university had not yet determined which scientists would be using the building. In this case, a modular and generic approach provides the flexibility. Over the last 15 years, UCSF has placed an increasing emphasis on collaboration between researchers of different disciplines. 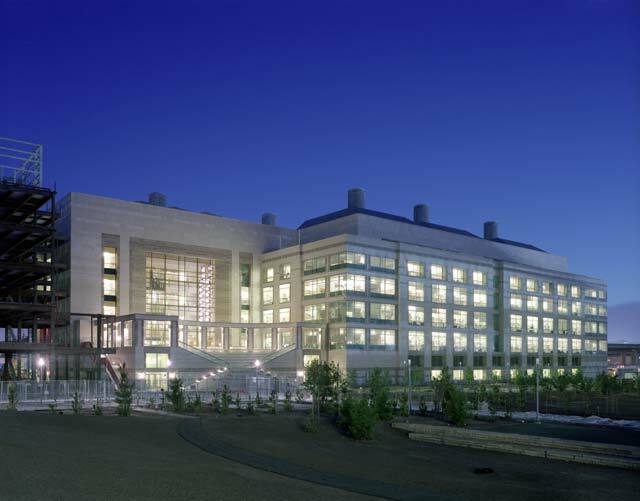 The $142 million, 434,000-square-foot, five-story Genentech Hall consists of two main laboratory wings, north and south of a central spine, and is designed to foster greater interaction among biologists, chemists, and medical doctors. Older laboratories generally link Principal Investigators (PI) and their assistants to a particular lab, isolating them from others. 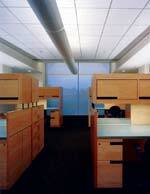 At Genentech Hall, the design groups PI offices together in office suites. Without walls dividing individual labs, researchers work in larger sub-dividable lab spaces that share secondary lab spaces. 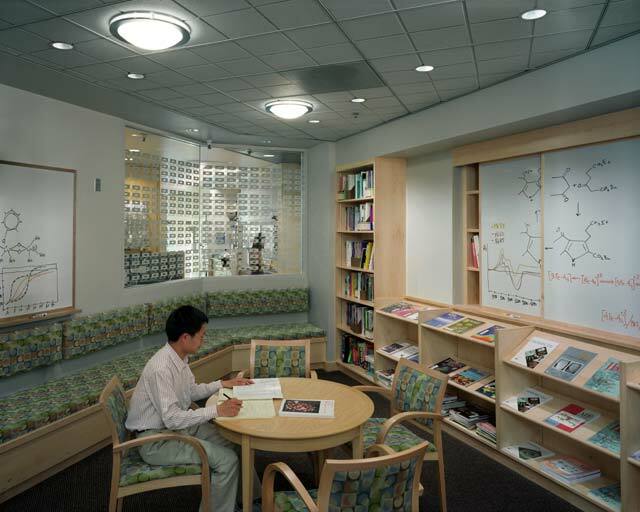 At the juncture between offices and laboratories, lunch/lounge/library spaces offer places to gather informally within each laboratory “neighborhood.” Dry erase boards near seating areas encourage the sharing of ideas. All access to labs or offices is through these gathering areas. 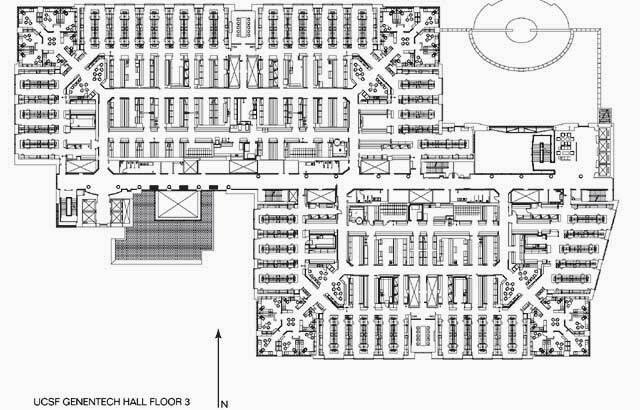 Each lab neighborhood is connected by the wide central spine to the five-story atrium and grand stair with interactive lounges overlooking the lobby at each level; a coffee shop and auditorium further animate the atrium. The basic lab modules are arranged in 14 neighborhoods containing both open and closed labs, offices, and the library/lounge/lunch areas. 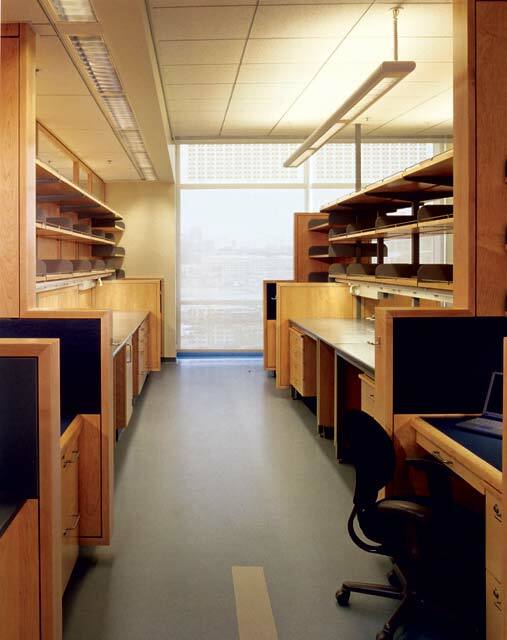 Glazed acoustical separations within the laboratory casework break the large six-, eight-, and 10-module suites into manageable areas that can be easily reconfigured. As a research program changes in size, it can take on or relinquish benches as needed. The benches have a desk at each end for lab technicians, protected from spills by divider panels. Support spaces are modular as well, and can be easily modified depending on research needs. Identical 10’6” x 20’ generic support rooms are all outfitted with a common building infrastructure of lab utilities, lighting, sink, and wall backing plate to support shelves or cabinets. Researchers can choose options that customize these generic spaces into a tissue culture room, equipment room, multi-use room, or fume hood room. All benches, cabinets, and shelving are moveable to allow for future modification. Every room has branch lines for piped utilities, which means systems can be reconfigured without having to shut down large areas of the lab. In open labs, the design places utilities in the ceiling, with connections running down through the divider panels to every bench. Half the benches are designed as moveable tables free to be replaced with lab equipment as required. 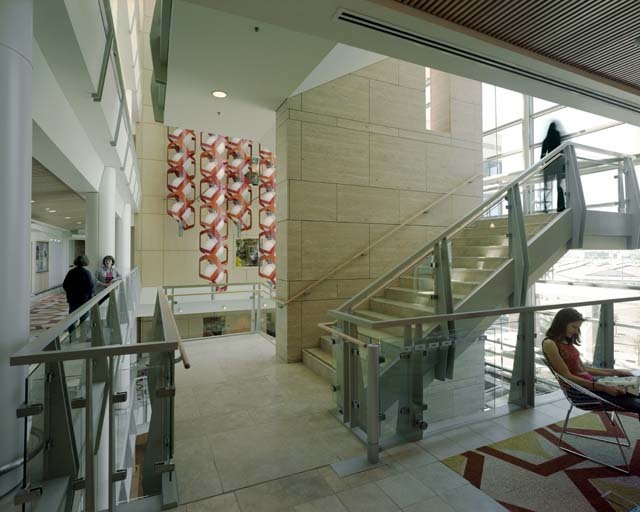 The emphasis on collegiality began with the master plan and design guidelines created by UCSF and its consultants, Boston-based Machado Silvetti Associates. The master plan describes the sequence of public open spaces and campus connective spaces that bring visitors and researchers to each facility. 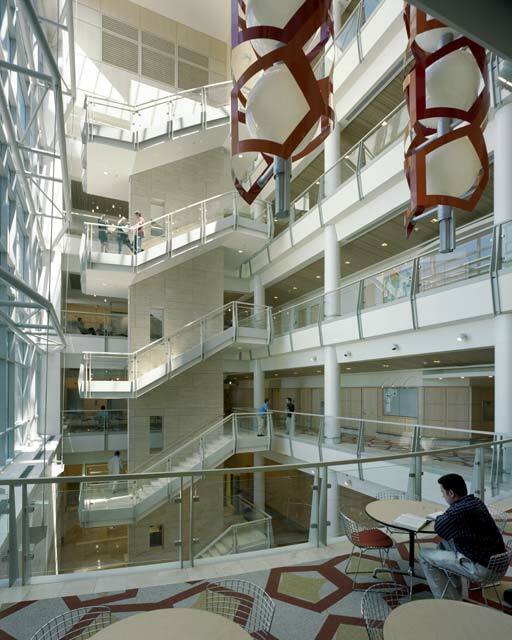 As the first completed building on the campus, Genentech Hall helps form the context for future projects, and links the campus’s hierarchy of open space to the building’s public areas inside and out. Genentech Hall’s outdoor colonnaded 338-seat amphitheater overlooks the campus green. Along with the glazed atrium, the amphitheater creates a collegial space that defines the building’s main entrance. On the south façade, a second-floor café with terrace also connects interior and exterior. The master plan and design guidelines call for all buildings on the campus to be divided into a one-story base, a four-story body, and a recessed cap housing the building’s mechanical equipment. While the bases and bodies of campus buildings are to remain fairly rectilinear, the tops of buildings, particularly of laboratories, are to take on more fanciful shapes, giving the campus a distinctive skyline. Genentech Hall features pyramidal forms at the building top. The master plan also defines a shared palette of building materials and colors, as well as a shared approach to façade and window articulation. 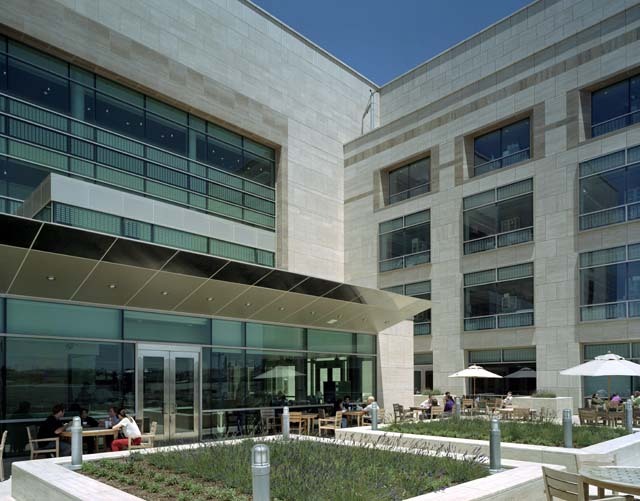 The building’s exterior cladding consists of an Italian “classico” travertine marble, chosen to harmonize with the master plan’s color palette. A brown “noce” travertine highlights window surrounds and banded accents, while the building’s mass is a lighter beige. Variations in windows give exterior expression to the interior program. Large punched openings define the labs, while broader areas of glazing front the offices and other interaction areas, such as the atrium, conference rooms, stairways, and café. All glazing is highly transparent, making activities within the building visible to passersby. "We designed a building that communicates stability and quality appropriate for a public institution,” comments SmithGroup Design Principal William L. Diefenbach, AIA. “It was not our intention to place an 'object' on the campus to compete with future buildings, but to create the first piece of a new neighborhood that would look beautiful and understated now and in half a century or more." 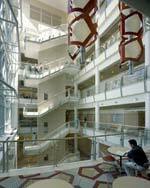 The project was awarded a 2003 Lab of the Year – Special Mention by R&D Magazine. Catellus donated 34 of the campus’s 43 acres to UCSF. The university and the developer plan to work together to bring private biotechnology companies to the neighborhood, which will also include housing, public facilities, and open spaces. The campus is becoming a catalyst for a community of scholars, turning what was once an empty industrial and warehouse district into a thriving neighborhood, and providing an economic engine for the city. The university has two laboratory buildings, a campus community center, and student housing already under construction at Mission Bay, and plans to add a parking garage, childcare center, and two additional biomedical research buildings over the next several years. Construction Company: Clark Construction Group, Inc.
SmithGroup, Inc. is an 800-person international, architecture, engineering, interiors, planning and landscape architecture firm. It specializes in the health, learning, science and technology, workplace, and urban design and planning markets. SmithGroup has offices in Ann Arbor, MI; Chicago; Detroit; Los Angeles; Madison, WI; Minneapolis; Phoenix; San Francisco; and Washington, D.C.
A hospital responds to the cultural, social, and spiritual traditions of Bangladesh, while incorporating state-of-the-art western medical technology. 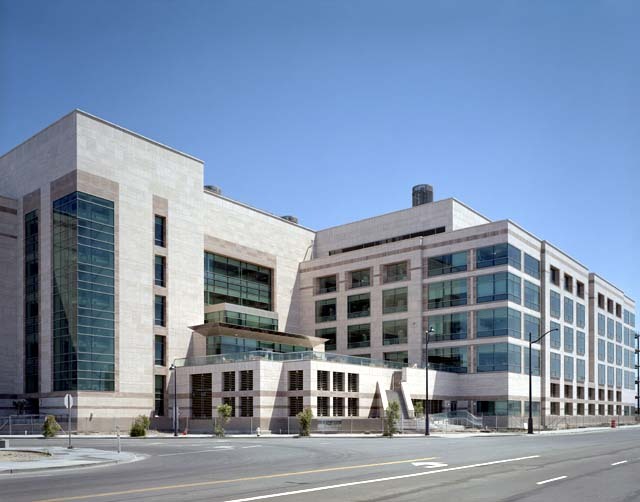 UCSF Genentech Hall is the first completed building at the university's new campus in the Mission Bay neighborhood.